Bribie Island is Moreton Bay's most accessible island as it has a bridge. This laid-back, family-friendly holiday destination in the very south of the Sunshine Coast has a wide range of attractions. One is four-wheel driving along 20 kms of Wooim Beach's 25 km white sandy stretch. Driving on Woorim Beach is only permitted between certain areas and requires a permit. 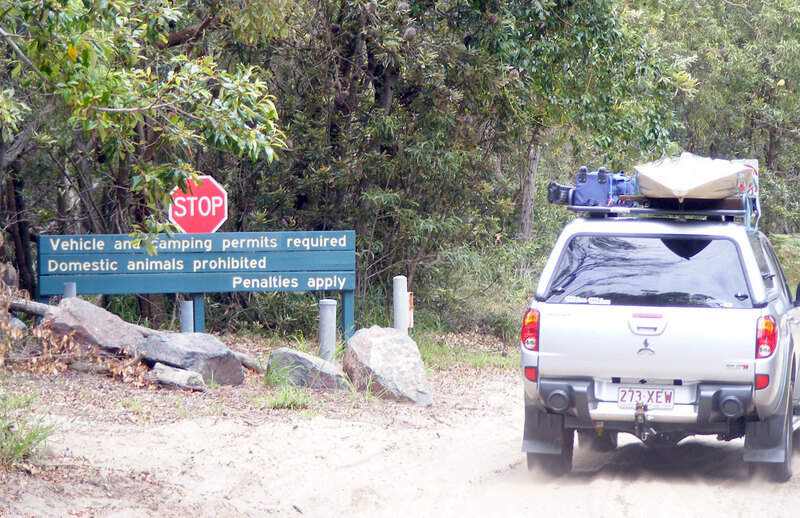 These permits can be obtained online on the Queensland National Parks website. At the time of writing this, they cost $47.85 for up to one week. This makes Woorim Beach one of the most expensive beaches to drive on, yet it also remains one of the most popular. Obviously you need a four-wheel drive, however, with the rise in popularity of SUVs or soft-roaders, this terminology has become somewhat ambiguous. Ideally, you would be taking a high clearance off roader onto the sand. When the tide is out, you can easily drive on the hard packed sand, but when the tide comes in, you are driving on the much softer and deeper sand above the high tide mark. While most soft-roaders can handle this, they don't do it easily. We actually had a soft roader as one of the cars with us on the trip. This was a car with all-wheel drive, where the wheels automatically engage as needed. However, for some reason, only the front wheel drive was working. It did okay on the hard sand but would keep getting stuck in the sand above the high tide mark, where it was very deep. Along with a good off-road vehicle, it is recommended that you bring a recovery kit if you get stuck in the sand. This includes recovery boards for giving you traction to get out of the sand, a tow cable and have tow hooks (you should attach these before getting onto the beach). Also, it doesn't hurt to bring a shovel with you. 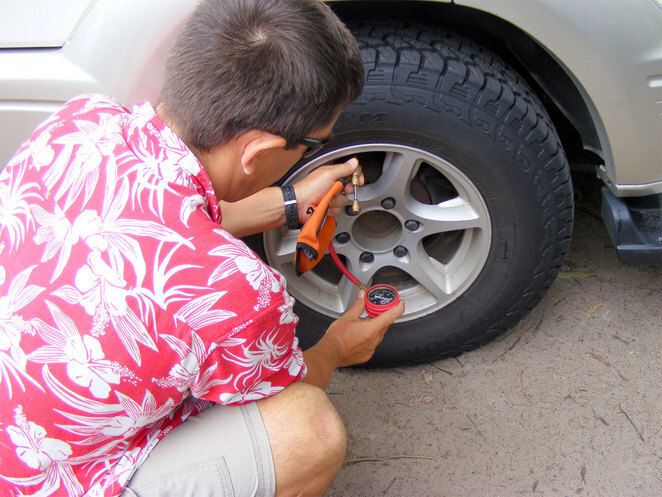 Don't forget the other basic preparation for beach driving, such as letting the air down in your tires to get more traction on the sand and checking the tide times. 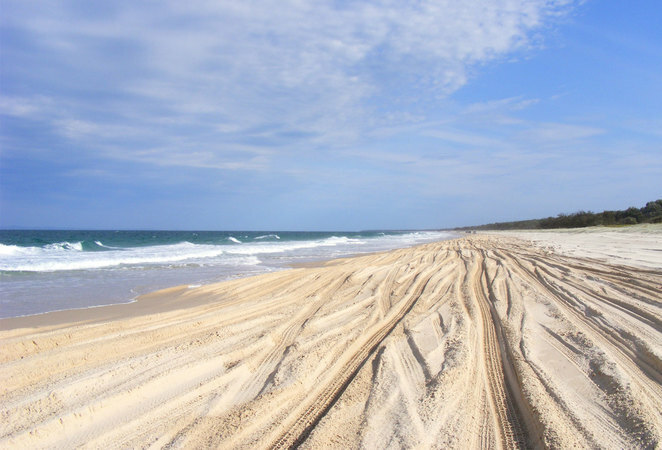 Woorim Beach has four-wheel drive road access at both ends of the four wheel drive section. The beach itself is best accessed at low tide, when you can drive on the harder sand between the water and the high tide mark. 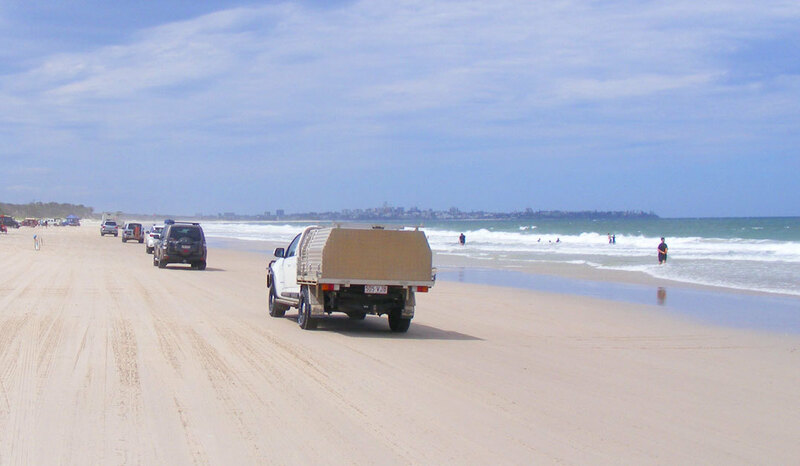 Weekends and public holidays can turn Woorim Beach into a bit of a highway. Yet you don't feel overly crowded and most people are driving at a reasonable speed and watch out for people on the sand. Woorim Beach is accessed from several points. The main one is the Ocean Beach Access Track at the southern end of the beach. This spot is well marked and you need to negotiate deep sand to get to the beach. If your car has trouble at this point, maybe it is best to turn back. At the very north of the beach is the Northern Access Track. This gives you access to the beach without needing a permit for the beach, you just have to park before you reach the beach. It also means that if you are worried about driving on soft sand, this road is an alternative way in or out of the beach at high tide. Driving the Northern Access Track as well as the other access roads still is best done with an off-road vehicle, but they are easier to drive than on the beach. The beach itself is lovely and its wide sandy foreshore provides plenty of places to play beach games. 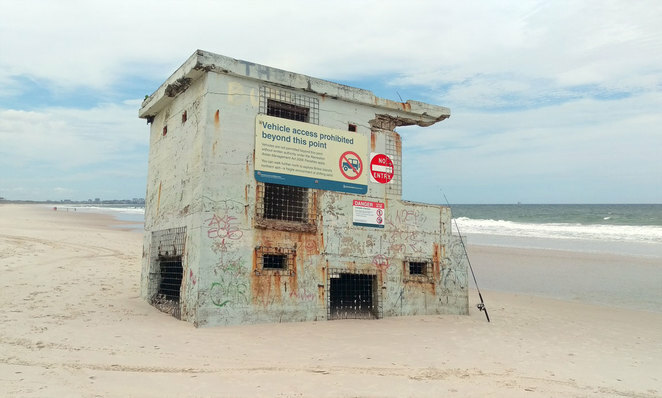 There are no surf living saving patrols on the four-wheel drive section of the beach. The water is fairly safe, but keep an eye out for basic dangers, such as large surf or rips. 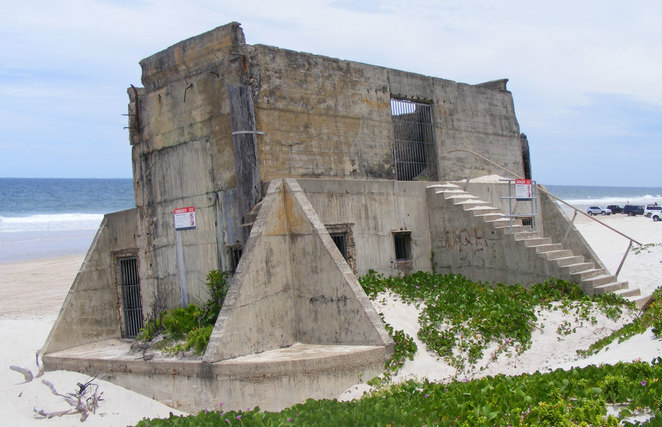 One of the main attractions are the World War II era bunkers built to protect Australia from invasion. These were hastily thrown up in the 1940s and are now slowly settling and subsiding at jaunty angles into the sand. The most northerly point you can drive to is marked by a bunker out in the middle of the beach. Beyond that, you can hike to the very end of Bribie, though few people do that. Another set of attractions are the several lagoons along the beach. Second Lagoon is accessible from the beach as well as inland by the road that leads to the Second Lagoon Camp Site. Mermaid Lagoon is also popular and I believe that there is a walking track to the lagoon from inland as well. Further north is the Welsby Lagoon, which is only accessible from the beach. I think this lagoon is often the most popular with four-wheel drivers because of this fact and that there is a wide sandy area to park off the beach by the lagoon. Camping is popular on Bribie island. For four-wheel drivers, the only place to really camp is the Ocean Beach Camping Area. This campground to the north of Woorim beach is only accessible by the beach. Remember to take plenty of insect repellent if you plan to spend the night at a beachside campground. 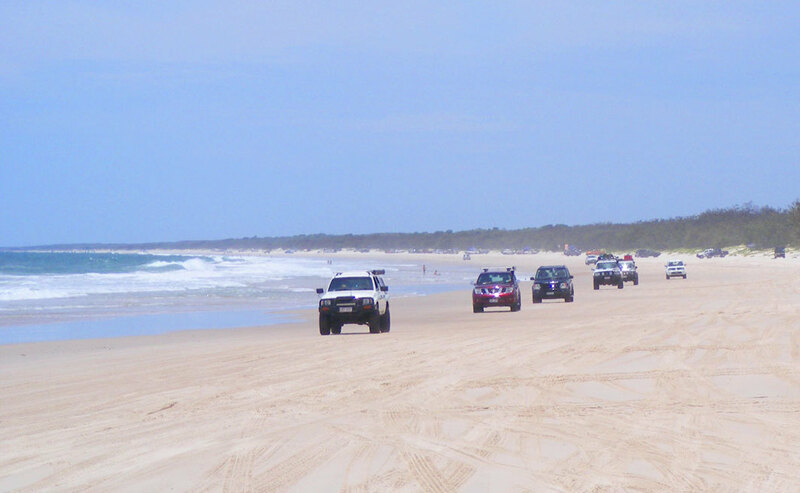 Woorim Beach is a great and easily accessible location for beach four-wheel driving. The minimum length of time of a week for the permits means that it is better driven as part of a longer trip, but it still attracts many day trippers as well. Remember that you can still access some of the lagoons and parts of the beach without actually driving on the beach. It is just one more way to enjoy Bribie Island. Interesting! Have never driven on a beach before. Will surely try this one out. ouch Roy not sure I'm keen on beach driving .. Bribie is beautiful without it! What was the soft roader?